The core Arctos locality model consists of 4 primary tables plus an edit archive. This guide and the following illustration describe their primary function and interaction. Specimen-Event is the link from specimens to localities. Specimen-Event is not shared; a unique instance exists for and establishes every specimen<—>locality link, so a specimen with multiple encounters or unaccepted coordinates will have multiple specimen-events. Collecting Event adds verbatim data plus dates. Collecting events are shared; one collecting_event may be parent to any number of specimen_events. In the case of co-collected specimens (e.g., hosts and parasites) maintaining one collecting event for multiple specimen-events is doubly critical. COLL_EVENT_REMARKS is any remarks concerning the collecting event. This field is a denormalizer; use with caution. Locality adds formality and vertical spatial data to collecting events. Localities are shared; one locality may be parent to any number of collecting_events. LOCALITY_REMARKS is any remarks regarding the locality. This field is a denormalizer; use with caution. GEOREFERENCE_SOURCE is the source of the spatial information. This field is a denormalizer; use with caution. Locality plus when and who, automatically maintained by an INSERT or UPDATE trigger. Geography adds formalized descriptive data to locality. Geography is shared; one geography may be parent to any number of localities. SOURCE_AUTHORITY is the evidence supporting the existence of or clarifying a geography entry. WKT_POLYGON is the well-known text polygon of the geography. Note that the introduction of this field changes the nature of the data; it is now possible to have “Alaska” defined as “things someone felt like calling ‘Alaska’” (e.g., hundreds of miles offshore, but somehow doesn’t feel like Russia!) OR as a spatial polygon (which might stop at mean high tide). In addition to the primary tables listed above, geology_attributes adds any number of hierarchical geology determinations to localities, table GEOG_SEARCH_TERM adds discovery data (such as old or local placenames, or placenamess in local charactersets) to geography, and several service-populate fields in Locality add automated georeference and reverse-georeference data which aids in discoverability and provides editing suggestions. The core data model is hierarchical; an example as a hierarchical “tree” is given below. All of the above is from one geography: North America, United States, Alaska. There are two localities given; we will focus only on Locality 1, which contains two collecting events differing only by date. Collecting Event 1-1 contains two specimen-events and, like all other specimen-events, each contains exactly one specimen. Collecting Event 1-2 also contains two collecting events, but in this case they contain the same specimen - perhaps a tagged individual which moved and was re-encountered on the same day. Note that the specimen<–>specimen_event relationship is always 1:1; all other relationships in this model are 1:∞. One geography may contain two (or zero or two million) localities, one locality may contain two (or zero or two million) events, and one event may contain two (or zero or two million) specimen-events. “The Old Model” consisted of two tables in a one:many relationship. “Locality” contained textual data, and “coordinates” contained spatial data. Zero or one coordinate determinations could be “accepted” for any locality. In this model, the “locality” data are structurally primary data and coordinates are structurally data about the locality, or metadata. Coordinates contained metadata (agent, method, date, reference, etc.) allowing precise tracking of their origin. There was no capacity to treat coordinates (eg, those downloaded from a GPS) as primary data. There was no history of the locality component; it was possible to edit a locality after it had been used to determine coordinates, which often lead to a partial and confusing “history” from the perspective of specimens. It was exceedingly difficult to find duplicates and “almost duplicates” (e.g., those records that differ by a few unimportant characters in the many free-text metadata fields). Localities are “facts” in this model and coordinates are “determinations.” There was no additional “determination node” between localities and specimens. “The New Model” consists of a single table in which coordinates and string-data (such as specific locality) are treated as parts of the same place or data object. The entire object is a “fact” - there are no determiners involved. The determination is inserted between the specimen and the entire locality stack; the determiner is asserting the the locality as a whole applies to the specimen. Bare coordinates, bare specific locality, specific locality determined from coordinates, and coordinates determined from specific locality are all possible. The model is much more normalized, although multiple denormalizers (locality remarks, datum, various distance units) remain. A specimen may have any number of localities, each containing a determiner and date, verificationstatus, and specimen-event type. Changes (INSERT and UPDATE) are logged, and these may be used to discover the agents who georeferenced, reverse-georeferenced, changed geography, make corrections (or introduced errors), etc. 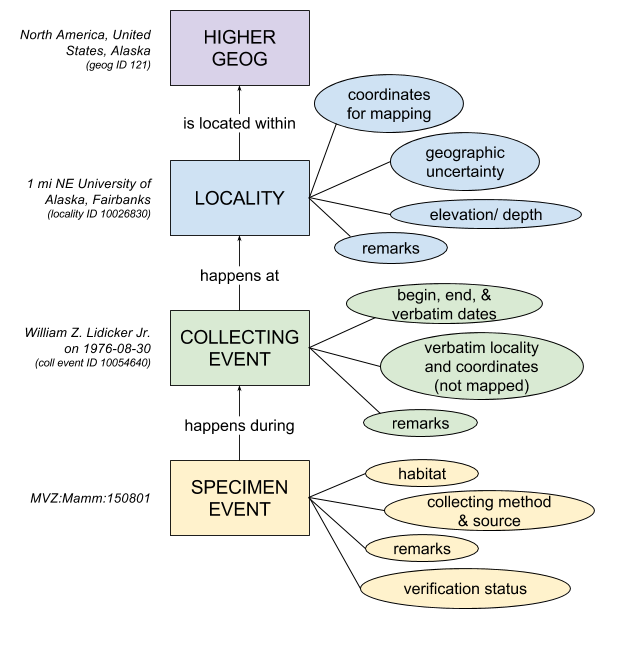 A full history of locality data may be maintained from the perspective of specimens by “verifying” erroneous data as unaccepted and adding a new locality stack with a not-unaccepted VerificationStatus.